The Shenandoah County Department of Fire and Rescue was established in 1998 at the foresight of the Shenandoah County Board of Supervisors. The Board of Supervisors could see a need in the future for paid personnel to supplement the volunteer organizations in order to provide the best service to our county residents and those that pass through the county in their greatest time of need and emergency. At the time, the County Board of Supervisors thought to place someone in a Coordinator position to provide volunteer training and assist in keeping fire and rescue apparatus up to date. Currently SCFR has a Fire Chief, Fire Marshal, Deputy Chief of Operations, Deputy Chief of Training, EMS Billing Technician, and Service Assistant seeing to the needs of the volunteer agencies and 49 career staff manning stations. SCFR promotes good communication and a positive working environment for all involved. New standard operating guidelines have been implemented so that the best quality of service can be provided to all. Shenandoah County Department of Fire and Rescue is committed to providing a safe community, protecting the life, property and welfare of residents and visitors to our County. 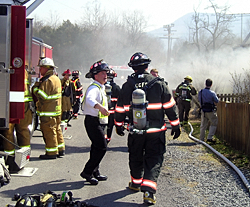 Shenandoah County Department of Fire and Rescue’s vision is to create and sustain a system of highly trained, professional volunteer and county-funded fire and emergency medical responders, together providing quality service for the community.